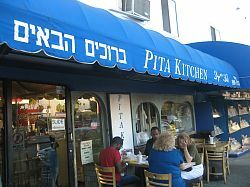 The unassuming blue awning has writing in both Hebrew and Arabic, a perfect testament to the Middle East cuisine sizzling on the grill inside. 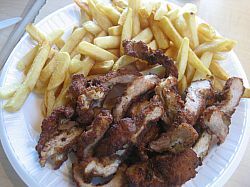 The rich aroma of lamb and cumin mingles with that of tender chicken and a hint of crackling French fries. Outside the sliding door, wooden tables are set out on the sidewalk, ideal for people watching and soaking in San Fernando Valley sun. It’s lunchtime, and Pita Kitchen is filled to the brim with people craving warm pita bread and lavash laden with creamy golden hummus. For those who can’t bear the intense summer heat, the small interior of the restaurant is sufficiently air-conditioned — and equally packed — with the sounds of endless chatter blending with the lightly spitting grill in the visible kitchen behind the counter. In the corner, there is a Hookah pipe, adding to the Middle East authenticity in the tiny space on Van Nuys Boulevard just north of Ventura. And though there isn’t much else in terms of décor — the restaurant sits innocuously next to an outdated newsstand — the atmosphere is one of gastronomic fulfillment, as enticing wafts of paprika infuse the entire restaurant and its environs. The kitchen is slightly frenetic, with chefs deftly flipping pita on the grill and slicing fat hunks of beef and broiled lamp for their monstrous shawarmas that are packed with fresh tomatoes and cucumbers. And though these shawarmas are arguably the best deal in the Valley — for $7, you get a wrap exploding with chicken or lamp and beef and Middle East spices and two heaping side dishes — the shish kebabs and falafel are equally as satisfying. And each dish is served on Styrofoam plates that often sag under the weight of the mounds of lightly charred meat. But take note: the restaurant only accepts cash for their enormous portions, but tax is included in the price. 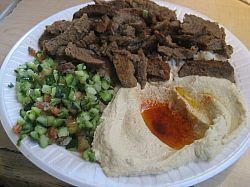 Stuff your own pita with the falafel plate ($8) or get it in a pita ($5) or a wrap ($6). Each main dish comes in three forms — stuffed into a warm pita ($6) , piled into wrap ($7) or fashioned onto plate $8-$10) over long grains of seasoned rice. 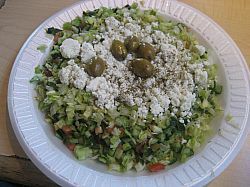 All the meat dishes, particularly the chicken plate, are delicious, with a hint of spiciness that is nothing a cool side of Greek salad ($5)— a mix of cucumbers and sprinkles of feta — can’t palliate. 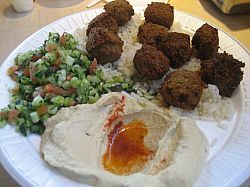 The falafel is superb, generous golden orbs that prickle with peppery spices. The crispy outside hides a moist center of chickpea delight. And though it’s excellent in a pita, with creamy yogurt sauce and strips of iceberg lettuce, it’s more fun to order a falafel plate and stuff them into a pita yourself. Besides, it makes popping them into your mouth even easier. Chicken schnitzel and fries on a plate ($9) or have it in pita ($6) or wrap ($7). The side dishes are equally as tasty — the babaganoush is served warm, with swirled eggplant cut with lemon, red pepper and a touch of paprika, the taboli is a fresh fusion of parsley, mint and lemon and the Mid-East salad gently soothes the spicy meat flavors. Though not on the actual menu, order a side of pickled vegetables and marinated olives for a salty-sweet accompaniment. Or just get a plate of thick fries to go with the zesty shish kebabs. And for desert, there’s baklava, drizzled with honey and candied nuts, a delectably sweet end to balance the meal’s salty explosion. And though might be nearing triple digits in the Valley, sit outside under one of the umbrellas and you might just be able to convince yourself you’re in the middle of Haifa overlooking a cerulean vista. And if not, at least you’re getting a cheap meal infused with authentic Middle East flair. I lived one block away from The Pita Kitchen for like five years. It was our Sunday ritual. Two shawarma wraps, extra hot sauce, cucumber salad and side of hummus. That was our entire Sunday meal. Yummmmmmy! Now that we’ve moved, we bike over there once a month. Jay Leno sightings at the newstand next door! The Pita Kitchen is a family favorite. The portions are enormous, order an extra side and the plates can easily be shared, and the staff is generous about providing more pita if you’re left with hummus or babaganoush and nothing to scoop it up with! The only problem is the parking – the rear lot is usually full and can be hard to maneuver with a large car. Allow time to find a spot on the street before settling in for a delicious and filling meal!